Migraid for Headache Relief- works within 20-30 minutes. Migraid is specifically designed for anyone who suffers from occasional headache pain. This kind of pain interferes with enjoyment of life�s pleasures, and anyone who suffers from it may benefit from Migraid. The Migraid formulation is composed of five herbal extracts (Juniper, Goldenrod, Dandelion, Meadowsweet, and Willow Bark) balanced for ideal synergistic action and then conjugated to naturally-occurring fruit extracts. The conjugated complexes act as carriers for the pain-fighting herbal compounds. When consumed, the fruit extract component of the herbal-sugar complex acts as a �shield� for the herbal component. The whole complex quickly passes through the intestinal wall and into the bloodstream, where it separates and the herbal component is released with all of its potency intact. Fragmentation by digestive enzymes and subsequent �neutralization� by the liver are thus avoided. Migraid targets some of the pain receptors that sense and send pain signals to the brain. Some types of headache can be caused by tissues that have become over-sensitive to chemicals that normally circulate in the blood. Things you eat or smell can cause the release extra amounts of these naturally occurring chemicals. The herbal extracts in Migraid have been used for many thousands of years in cultures around the world and contain compounds that have been determined to fight different aspects of these uncomfortable sensations. The Migraid formula includes a balanced ratio of the herbs Juniper, Willow bark, Goldenrod, Dandelion, and Meadowsweet. These herbs mount an attack to stop your occasional symptoms. INGREDIENTS: Extracts of juniper berry, goldenrod flower, dandelion leaf, meadowsweet, whole grape extract. USAGE: 1-2 capsules as needed. I suffered for 3 years with headaches, took half a dozen drugs! For 3 years I suffered every day with headaches. I used all kinds of prescription drugs and nothing worked. First dosage of MIGRAID #15 gave me finally relief. I�m so grateful this suffering is over. Sidonyra Membeno, 48, Whittier, CA MIGRAID Headache Relief #15 makes life manageable! I suffered for 10 years with migraine headaches. After taking your product in the last 2 weeks I have not had an attack. If I had that feeling coming on it quickly disappeared after taking my morning dosage. It saves me a lot of pain and money, as I was missing work because of the severity of the headaches and vomiting. George Fotopoulos, 41, Land O Lakes, FL Nurse says after 20 years finally a migraine pill that works! After 20 years of numerous trips a month to the doctor because of my migraines I finally found Bell MIGRAID Headaches #15 that really works for me. No more trips to the doctor and no more drugs needed. I�m telling everybody. Pamela Y. Goodright, 40, Oswego, KS 16 years of daily headaches are gone! Nobody that didn�t go through this will understand what it is like to have headaches daily for 16 years. From taking every day Aspirin, Excedrin and others I had side effects such as bruising, excessive thinning of blood. I was very skeptical. Now I�m a believer and tell everybody. It�s an incredible feeling to be pain free. I�ll never be without it. Sidbhan Wood, 52, New Smyrna, FL Prescribed migraine medications made me drowsy! I experienced terrible migraine headaches during the last 2 years in highschool. Our doctor put me on medications that made me drawsy and would not even knock out the headache. My mom told me to try MIGRAID Headaches #15. Wow! The headaches disappeared every time I felt one coming on. Now I just need a capsule occasionally. MIGRAID is wonderful! I feel like I have my life back. Megan Tietjen, 17, Mapleton, UT MIGRAID worked when other meds didn�t! For 30 years I have had headaches and always used all kinds of prescription drugs and nothing worked as well as Bell�s MIGRAID Headache #15. The first dosage gave relief. It was quite a surprise. Great product! Marilia O�Knall, 50, Santa Fe, TX Used every drug on the market for my headaches! I have had headaches for most of my life. 5 years ago I woke up with such a strong headache that I could not stand it anymore and went to the doctor. He would give me an injection to �knock me out� when I could no longer stand the pain. I did not expect that Bell MIGRAID Headache Relief #15 would help me. It did! My headaches decreased by 50%. Other people with no headaches may say this is not that much. However, I can now function again and have my life back. I�m truly grateful after suffering for years. Kenneth S. Margnet, 35, Big Pine Key, FL 15 years struggle with migraine headaches! I�ve tried all the OTC drugs as well as the prescription drugs that were all a lot more expensive than Bell MIGRAID Headache Relief #15. I tried your product with some trepidations and was pleasantly surprised about how effective it was every time within 30 minutes. Maranca Daniels, 42, Murfreesboro, TN I felt death would be better than keep on suffering headaches! In the last 3 years I suffered extreme headaches. They were so bad that I wished I would die. I could do nothing anymore with my life. I was waiting for death. After taking Bell MIGRAID Headaches #15 I had complete relief and everything is back to normal. Grace Kwibe, 47, Montreal, QC Was in emergency, tried all prescription medications! For the last 2 years I had repeated migraines almost every day. I was in the hospital for 2 weeks, they made all tests including MRIs, tried every drug they had. Nothing worked. I was praying to die. My mom bought Bell�s MIGRAID Headache Relief #15 as it was highly recommended by the health food store. I tried it out of desperation. It worked in 10 minutes. I couldn�t believe it. I want to express my gratitude to your company. Christy Logue, 32, Tulsa, OK Healing the abuse of 15 years of headache drug use! For more than 15 years I suffered with migraines and my experience was that all the drugs I used contributed to the problems and made in worse. Your Bell MIGRAID Headache #15 not only relieves the migraines quickly it also is healing the damage that was done over the years with the drugs I took. Diana Gabriel, 54, Grand Haven, MI My migraine was gone in 30 minutes! In the last 10 years I suffered a lot with migraines. I would take up to 4 Advil or Tylenol Rapid Release. None of these worked well enough. After I tried Bell MIGRAID Headache #15 I was blown away as it really worked within 30 minutes without side effects . I�m totally amazed! Absolutely floored! I�m telling everybody. Michelle Woodman, 29, Crystal Falls, ON First medicine that worked for my migraines! For the last 7 years I had increasing debilitating migraines. I�ve tried all the drugs available and nothing gave relief. Finally I found the natural remedy of Bell�s MIGRAID Headache Relief #15 that really works as advertised within 30 minutes. It helps to maintain my busy life style. Kelli Mayes-Denker, 27, Bettendorf, IA Migraine torture for a few days every month! For 10 years migraines that lasted every month for a few days during my menstrual cycle. They were increasing in frequency and severity. Nothing from medical doctors or remedies would help. Finally I found Bell�s MIGRAID Headache Relief #15. I felt a decrease in 30 minutes and complete relief within an hour. This product is a God sent! Donna M. Cardone, 45, Staten Island, NY 50 years of suffering with migraines finally alleviated! My life changed when my daughter brought me a bottle of Bell MIGRAID Headache Relief #15. After 20 minutes my head was clear again. It said so on the box and I couldn�t believe it after taking all the drugs available in a drugstore. I was able to function, watch TV and even drive my car again, which was impossible with my migraines. Thank you! Atalia Wodey, 72, Texas City, TX Migraines, tried every prescription drug! I had taken any and every prescription drug in the market in the last 3 years. I had two visits to the emergency room. I was kept there for 2 says on morphine. The side effects were almost as bad as the migraines themselves. So I decided to try herbal alternative medicine. After the first 2 pills of Bell MIGRAID Headache #15 I felt the difference. The clouds opened up. Only someone with this kind of headache understands. It�s unbelievable how good I felt with these little pills. Thank you. Nara Wilson, Santa Fe, TX Headaches since childhood gone! I�ve had headaches since childhood and since age 18 I had debilitating migraines for the last 10 years. I have been on a variety of pain management medications with limited success. As a result my quality of life always has been low due to daily pain. Bell MIGRAID #15 took the pain away in about 30 minutes. I couldn�t believe that a natural ingredient would be so much more effective than all the drugs I took for so long. Sarah Wong, 28, Fresno, CA Daily suffering with migraines alleviated! I suffered with migraines for as long as I can remember and nothing I took would completely relieve it or prevent it from recurring�until I discovered Bell MIGRAID #15. I�m truly amazed and happy to be without the daily torturing headaches. I take now 1 capsule a day and it really helps me. I love this product. I�ll use it for the rest of my life. Beverly McFadden, 29, DeFuniak Spgs., FL Relief from frequent migraines! I�ve suffered from daily headaches and migraines for 20 years. 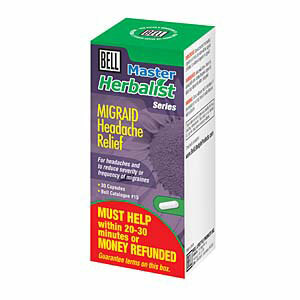 My health food store recommended Bell�s MIGRAID Headache Relief #15. I took 2 capsules and within 30 minutes my migraines virtually disappeared. I�ve been taking 1 capsule at night and one in the morning and have experienced very few headaches ever since. This product is a true miracle for me. Kris Szulczewski, 43, Hales Corners, WI Migraine relief for mother and daughter! 15 years of suffering with migraines ended when I found Bell MIGRAID Headache Relief #15. I congratulate you for this wonderful product. The change in my life is unbelievable. My daughter is 18 and also suffered with terrible headaches until she tried MIGRAID. It�s like a miracle come true for both of us. I�ll tell all my friends about this amazing product. Marcia Perez, Miami, FL Works great for my migraines! My daughter suffered with migraines and your MIGRAID Headache Relief #15 helped her. She told me to try it, because I suffer as well with migraines for the last 15 years. I love it. It works great! Monica Mossing, 70, Bengough, SK Finally headache free! After numerous lifelong trips to doctors, chiropractors, neurologists and after taking all prescription and OTC pills I�m finally migraine free. I had a number of them every day. Since taking MIGRAID I had none in the last 3 weeks. This is a miracle from God. Thank you for giving me my life back! Angela Neumann, 30, Milwaukee, WIK Finally a product that helped my migraines! Among the 5 different migraine medications I took Imitrex helped most of the times. However, it made me sleepy or I felt sick. My father read about Bell MIGRAID. I was skeptical. It helped! And it doesn�t make me sick or have other side effects. I�m keeping it in my purse. I never know when the next attack comes. I�m finally back in the land of the living! Margo DeBruyne, 50, Ceylon, SK Best headache & migraine relief medicine I�ve ever used! For 10 years I�ve been suffering intensively and frequently. All I would get from my doctor is being told to take more Tylenol and other drugs. Sure my headache was sometimes gone but at the expense of severe side effects in my organs. MIGRAID works quickly and with no side effects. Best product I have ever used. I was absolutely delighted & overjoyed that I was blowing horns to family & friends. Doris Collins, 40, Goodfish Lake, AB Migraine free at last! After taking MIGRAID for 3 days I woke up in the morning migraine free. I suffered for 10 years. This natural pain relieved is a miracle! Tytti Smith, 56, Sooke, BC 10 years of migraines gone! I was taking daily a variety of drugs including prescription drugs with codeine with limited success to get over the day and be able to sleep. My headaches were debilitating and life was difficult. Finally the local health food store Bell MIGRAID #15. I was very skeptical. It worked. It�s like a miracle!! Your product is worth its weight in gold. I feel like a new person. My mother had the same headaches and she had complete relief as well. Alana Greenberg, 36, Richmond Hill, ON Suffered for 20 years with headaches! Headaches were getting progressively worse in the last 10 years. I�ve tried drug treatments, allergy tests with no real relief. MIGRAID drastically reduced the intensity of my headaches by 80% and made life bearable again. What a relief! Ruth Dilts, 46, Courtney, BC Had headaches and migraines every day! It was torture to face this every day. I would pop Tylenol like candy. Nothing worked. Until one day I was nosing around the store and saw MIGRAID promising relief in 20-30 minutes or money refunded. I was very skeptical and said: Ya right! I thought what could I lose? True enough, within 30 minutes pain diminished greatly and I could focus again. First real relief in years. Lyle Smith, 35, London, ON MIGRAID works better than drugs! Wow! I�ve suffered with headaches on a daily basis for years. Two capsules brought relief in 10 minutes. Nothing of all the drugs and remedies worked as effectively and quickly as MIGRAID. I�ll take it for as long as you make it. Amanda Letcher, 26, Burnaby, BC Better than narcotic pills! I was amazed that MIGRAID could ease such pain without narcotics. It was so great, because you didn�t have another episode after the narcotics were wearing off. This is what often happened to me. I�ve suffered for 3 years. Nicole Stewart, 31, Elgin, ON Years of headache suffering 90% gone! For the past 7 years I had headaches daily. I tried everything available and was always disappointed. MIGRAID helped me finally. 90% of my suffering is gone. I�m happy again and enjoy life every day. I�m telling everybody who wants to listen to me what has helped me. Nora Vallee, 42, Gatineau, QC Weeks of migraines gone! Your MIGRAID headache natural product has helped me a lot. I suffered with migraines for many years. I had stabbing pains that lasted for weeks and felt very helpless and depressed. I tried many prescription drugs my doctor gave me that were of no help. Finally I had relief with MIGRAID. I can enjoy life again. I really appreciate it. I�m overjoyed! Nicole Maltais, 51, Edmundston, NB Migraines were so bad had to be hospitalized! I suffered for 20 years with the worst migraines. When pain killers did not work I had to be hospitalized. I was so surprised when I took 2 MIGRAID pills and my migraines completely stopped . I take now 1-2 a day for prevention. I�ve not had a migraine in 2 weeks, which is extraordinary for me. I�m forever grateful! Thank you so much. Nicole Stewart, 31, Oshawa, ON In 15 minutes migraine relief! Since my early twenties I suffered with migraines, always as a part of PMS. My husband got tired of watching me suffer. Knowing that I refuse to take harsh chemical medications, he went to the health food store and bought Migraid Headache Relief. It worked in 15 minutes and I could walk around and function almost as good as before! I had one more migraine attack after that, but Migraid helped again quickly. Thank you for a great product! Sofia Wallgren, 32, Toronto, ON In 20 minutes headache relief! Your product is a godsend. I�ve tried all the headache medications on the market with no relief of symptoms. I�ve suffered for 5 years. They were painful migraine headaches that made enjoying activities such as listening to music impossible. Bell Migraid Headache Relief helped within 20 minutes. Patrick Brochy, 35, Grimsby, ON In 30 minutes headaches relief! I suffered for 6 years frequent migraine headaches. Like everybody else I know, I tried everything to get rid of these miserable periods. Because nothing worked before, I did not really expect that Bell Migraid Headache Relief would help. I was delighted when the relief started and within 30 minutes all pain was gone. Tammy Martin, 29, Beaverlodge, AB Bell MIGRAID headache relief is awesome! Since my teens I suffered with migraines every 2-3 days. I�ve tried numerous drugs and herbs. One prescription was $125.00. My boy friend showed me an ad about Bell MIGRAID headache relief. It changed my life. I�m so relieved and thankful. It�s a truly a wondrous thing. Since taking it for about one month I had only one minor migraine. I now take 1 capsule a day for prevention and I�m virtually pain free. Thanks! You guys are awesome! Darka Czemerynski, 27, Winnipeg, MB Headache gone in 30 minutes! I had a headache for long hours. I did bring your MIGRAID Headache Relief with me . After I got home I took some and it almost completely disappeared in half an hour. Nikoletta Gaspar, 28, Edmonton, AB Terrible migraines disappear quickly! M y migraines disappear shortly after taking Bell MIGRAID Headache Relief as indicated. I suffered with these terrible migraines for many years. It seems like a miracle to be rid of these long pain periods. There�s no need to suffer anymore. Dale Dogan, 46, London, ON My migraines gone in 30 minutes! I discovered that Bell MIGRAID Headache Relief works like a miracle for me. After trying it with 2 capsules it quickly reduced my migraines almost completely and 30 minutes later I could function normally again. Stephanie Ethier, 27, Gatineau, QC In 20 minutes migraines gone! MIGRAID is awesome! I suffered daily for 40 years. I take one capsule in the morning and one at night . My husband makes sure I don�t forget my miracle capsules. He likes to have a happy carefree wife, instead of a miserable one he had to endure for so long. Lise Robichaud, 53, Winnipeg, MB Headache relief for 8 months! Like most other migraine sufferers, I have tried just about everything available in the last 40 years. Nothing was of real help until I found Bell MIGRAID. What really frightened me was my eyesight was affected with flashing �aura� disturbances making me to stop everything I was doing and lie down. This has not happened for 8 months. This is such fantastic news for me and I�m thrilled to be able to carry on with my life without worrying about sudden incapacitating attacks. I don�t know what I would have done without this miracle product. I�m taking one a day as a prevention. Pauline Carrick, 68, Port Hope, ON In 15 minutes migraines gone! For at least 12 years I�ve experienced migraines daily. My husband purchased a bottle of Bell MIGRAID for me. I had high hopes but those were surpassed. When I woke up today I had a particularly violent headache. This type of attack has landed me previously in the Emergency Room to get an injection. Instead I took my first 2 MIGRAID capsules. Within 8 minutes the headache covered less area and within 15 minutes it was all gone. The product is a miracle in my life. I�d say there is hope for everyone. Bimini Colt, 28, Kingston, ON Amazing relief with MIGRAID! I am ecstatic to say after 10 years with severe migraine attacks, your product MIGRAID alleviated my migraines quickly. I will continue to take a maintenance dose to control future attacks. Lynn Duchesne, 50, Owen Sound, ON MIGRAID gave me a new life! I�ve been using your product for 18 months and I feel like a new person. In the last 60 years I suffered so much pain and nobody could help me. They all took my money and gave no relief. I�m a happier man now. I�m also eating better. I�ll always be using your product. There is nothing else out there that works. Migraines lasting 2-3 days gone! I�ve had pulsating inflammation headaches for 6 years that could last for days. I had to stop working. All the drugs I took like Tylenol, Advil and others made my life still more miserable with stomach ulcers and heartache. With MIGRAID my headaches disappeared within 20-30 minutes. This is the most wonderful product ever. Eliminated all my years of suffering. I�ve recommended it to may people. It�s a common health problem. Migraines gone within 1 hour! I was getting migraines on a regular basis, which doesn�t help with little kids around. I tried your product and within 1 hour my migraines had eased off and the symptoms like light sensitivity were gone. The best part was I didn�t feel drowsy like with the drugs I was taking before. I could continue through my day without having to hide in a dark room. I was truly amazed how well and how fast this product worked. Stephanie Walker, 34, Stayner, ON Unbelievable! No more headaches! As I suffered for 15 years and used everything, I was very skeptical. But I�m now a very happy and headache free customer for life. I will definitely relay this to all family and friends. Fantastic! Unbelievable! Thank you. Beverly Sullivan, 64, Winnipeg Beach, MB No migraines, like a new life! I had bad migraines and took 10-12 Tylenol every day. In our newspaper I read taking that many drugs a day increases the risk of liver failure. Three weeks ago I started with 3 Bell MIGRAID capsules, because I thought I need more in my case. Then I tried two a day. Now I�m down to 1 a day and feel great. All headaches and discomforts are gone. It�s like a new life for me! Leo Sopaz, 80. Hamilton, ON Migraines gone in 20 minutes! MIGRAID is a God sent for me. I have been suffering with migraines for 10 years. Took 2 pills during a full blown attack and I swear in 20 minutes the pain went away. I could not believe it. I�ve tried everything. I experienced severe stomach up-sets, including ulcers, from all the medications. So I was at my wits� ends. My husband did a good deed to buy buying a bottle of MIGRAID. I was skeptical, but I was desperate. So I tried it. Oh my God, it worked. I'm headache free. Mary Pittarelli, 43, Bradford, ON Bell�s MIGRAID Headache Relief is amazing When I had my migraine days I had to stay off work. The prescription drugs made me woozy and nervous. Bell�s MIGRAID Headache Relief is amazing! It stopped my migraines in the tracks without side effects. On one very bad day I took 2 capsules every 2-3 hours and sailed through the day. It paid for itself many times over, because I don�t miss work anymore. Thank you for this fantastic product! What a relief! I have been suffering from migraine headaches for as long as I can remember. I have tried everything from over the counter medicine to prescription drugs. I've had headaches so debilitating that all I wanted to do was stay in a quiet, dark room to get rid of the pain. After taking Migraid, my headache was gone in about 15 minutes and I felt completely refreshed. What a relief! Also, I wasn't bothered by the usual stomach discomfort associated with drugs. Rob Patry, Burlington, ON No more migraines I suffered with migraines for 7 years. Rarely a day off. Pain was excruciating, felt weak and disoriented and needed ice packs. Took 7 medications and shots. Medications were expensive and weren�t working. The best day of my life was when I discovered your natural headache relief product. With 2 capsules a day and eliminating chocolate, caffeine, aged cheese, processed meats and other junk that were possible �triggers�, I have no more migraines. During the NNFA Show, I had a horrible migraine that made me actually sick to my stomach� all I wanted to do was lay down with a blanket. The lights and everything made me very ill. After taking two Migraid I felt incredibly better (after 20 minutes) and was able to walk and talk again. The paralyzing grip had been lifted. Thanks for the help!! I had meetings that day, and would not have been able to make the meetings without Migraid. Lesley G., Walnut Creek, CA Thank you for a great product My daughter Devon has been plagued with �cluster migraine headaches� ever since she was about 9. We tried quite a few of the prescriptions from the doctor as well as regular over the counter items. The prescriptions worked but the side effects made my daughter not want to use them. They made her sleepy and sluggish, something she cannot be while around her horse so there was also a safety issue for us. I heard about Migraid and obtained some. We love that it is all natural and has no side effects at all. She no longer is knocked out by her headaches and can function safely and pain free. Thank you for a great product. Kari M, Litchfield, ME Migraid worked! Last October, during the Natural Products Expo � East, where I was working as a helper for Edward & Sons, I suddenly began to feel the symproms of a migraine headache. Alison Cox told me about Migraid and recommended that I visit your booth. You kindly gave me some samples of Migraid to try, saying I would start to feel relief in about 20 minutes or so after taking it. And, just as you said, I noticed a significant improvement 20 minutes later. 30 minutes after taking it, I was already feeling 80% better! Migraid worked! And, as a vegan, I appreciate the fact that Migraid doesn�t contain gelatin. Thank you. Ceryl, Kucsera, Silver.